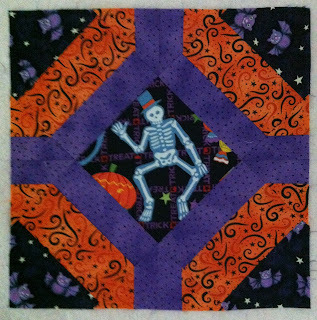 My offering for the Wicked Blog Hop is a pieced block, a make-it-your-own block, in this case done in Halloween fabrics, but it could easily be done in Christmas fabrics, or novelty fabrics, or just any color combination. 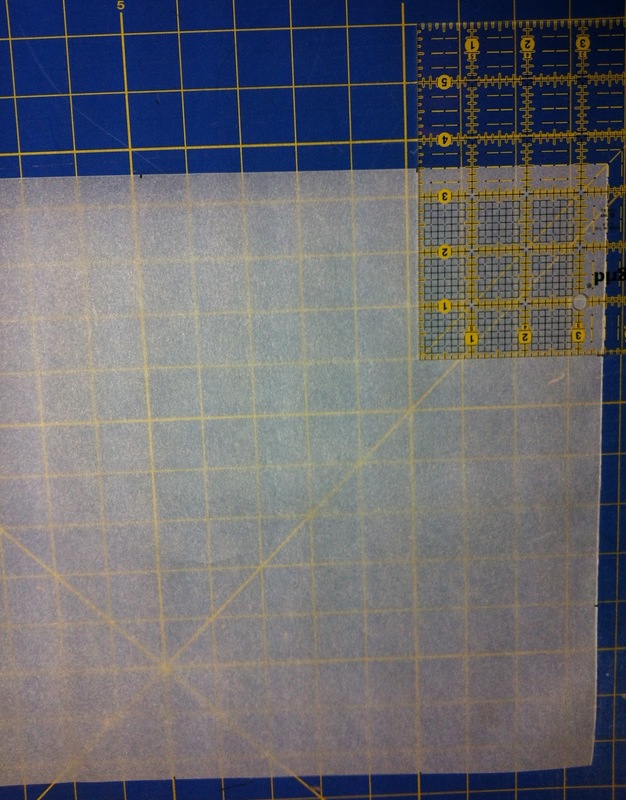 And since you draw it yourself, you can work with your own dimensions and make the block truly your own. 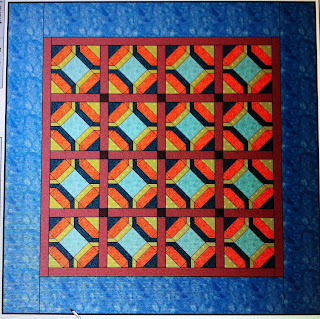 This block is something that I sketched out several years ago after seeing it on an episode of Simply Quilts. 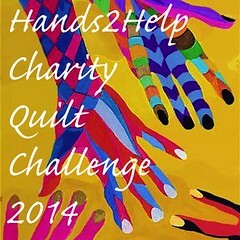 I have it noted as Imagine block, Episode 630, Agnete Kay, One Block, Many Quilts. 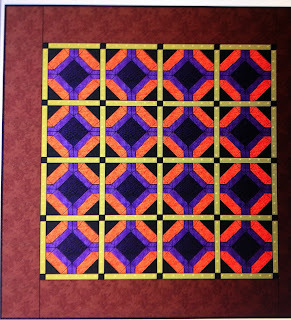 I don't know if this quilt block appears in that book or if that was just the book of hers that was out at the time. I'd like to show you the steps to go through to create your own block. 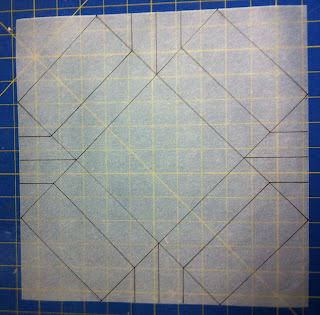 Start with a piece of paper suitable for paper piecing. I use onion skin paper that comes from an art supply store. It's easy to draw on and stitch through, and it's easy to remove after sewing. 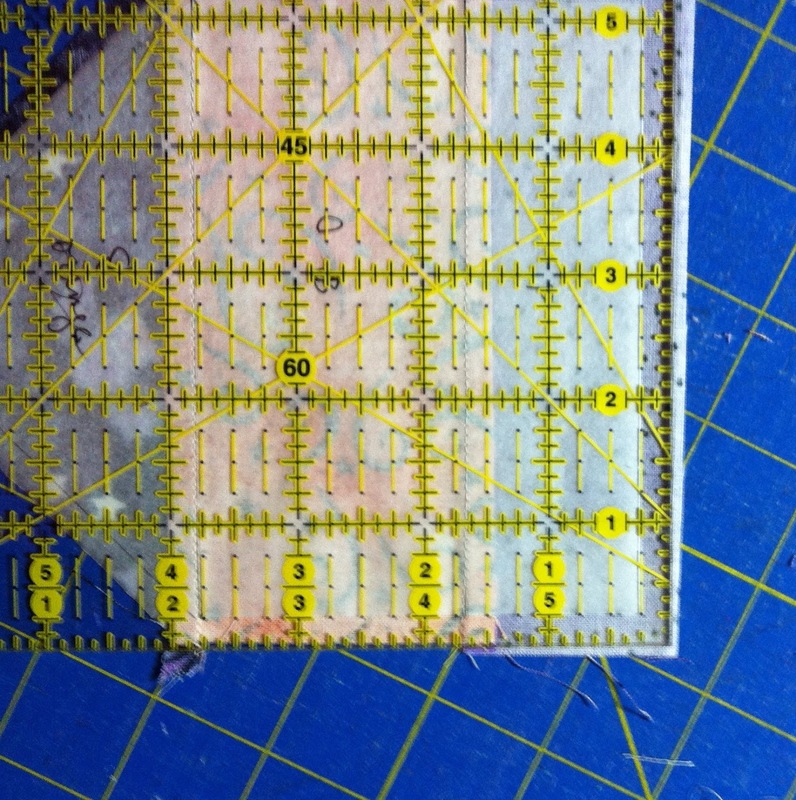 Draw a square the dimensions of your finished block. 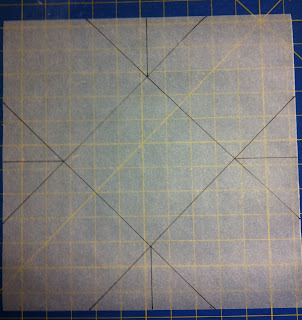 On each side, make a mark the same dimension in from the corner, a total of eight marks. I used 3-1/2" for mine. Connect those marks on the diagonals. 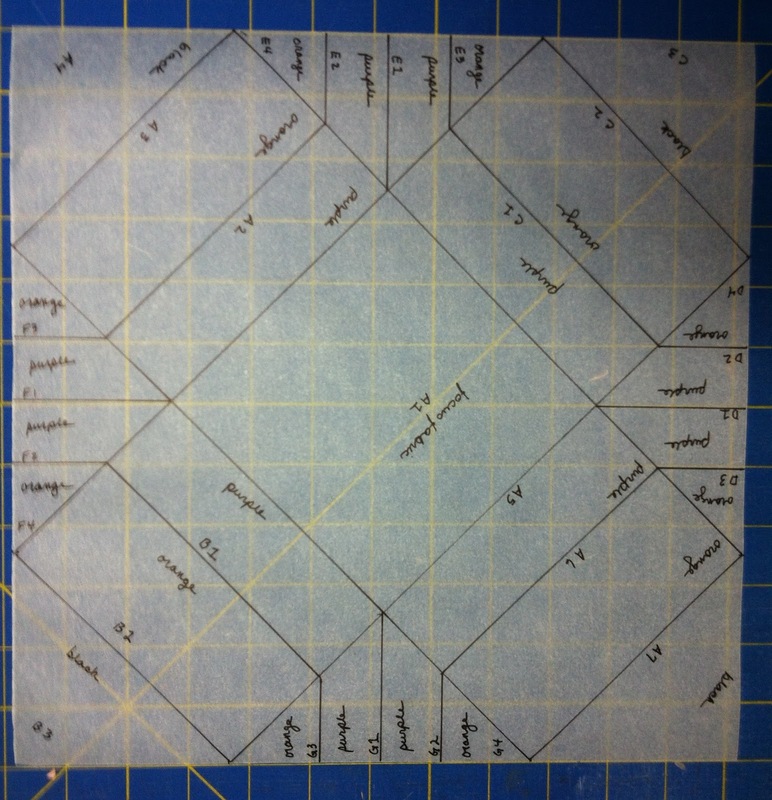 You will end up with four diagonal lines, and your center square in a square will be revealed. Draw a horizontal and vertical line at the center point of the sides, leaving the center square unmarked. 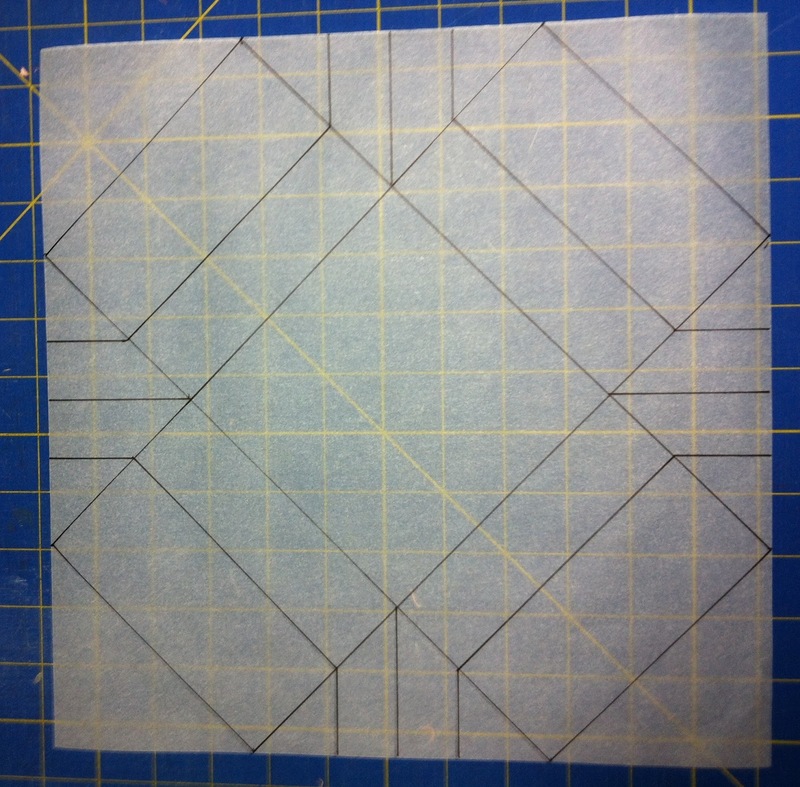 You will have short lines perpendicular to all four sides. 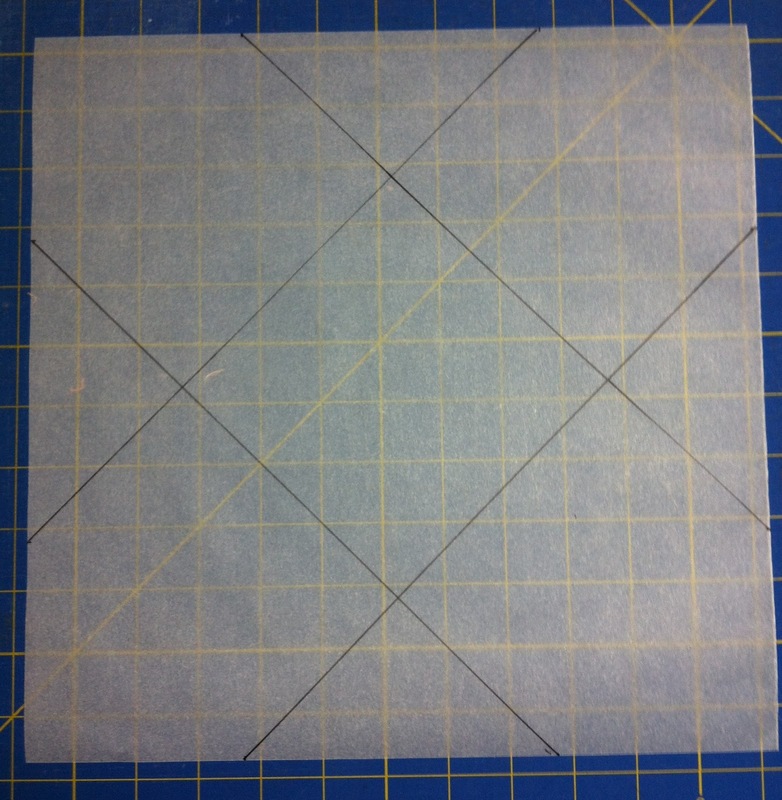 Pick a dimension (I used 1") and draw a line on either side of the horizontal and vertical lines you just drew. You will be adding eight lines, in the outer triangle area only. 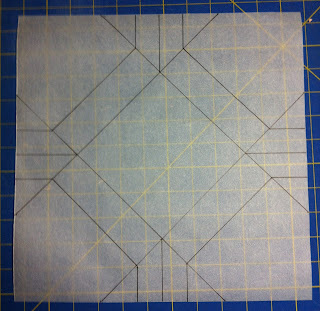 Now connect those lines you just drew on a diagonal at each corner of the square block. Your lines will be parallel to the first diagonal lines you drew. This is the point where the original block ends. 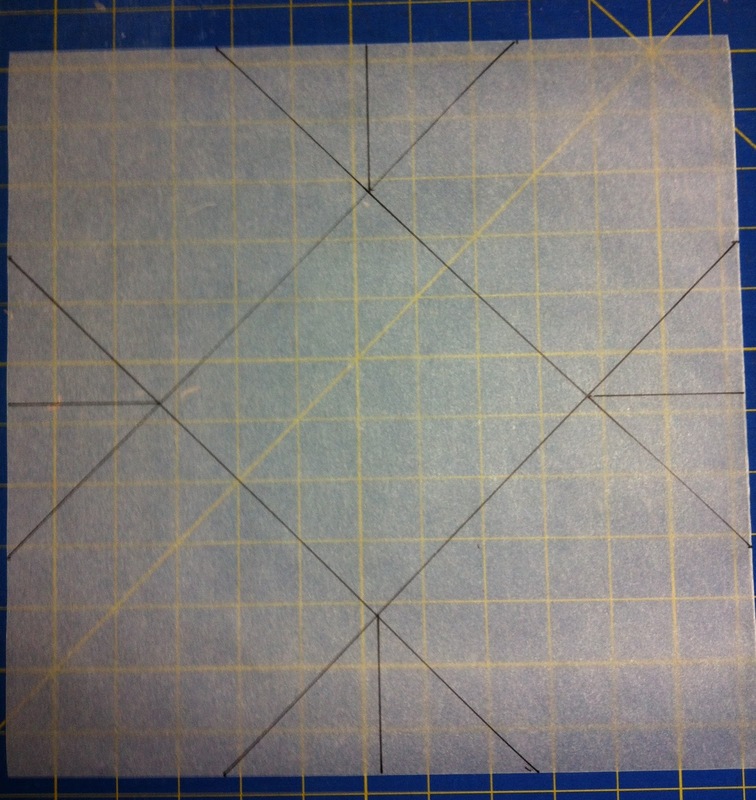 I chose to add four more diagonal lines in each corner, connecting the corners between the original diagonal lines you drew. Now you have your block drawn. How to construct it? 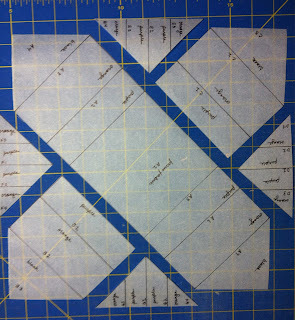 Paper piecing, of course! 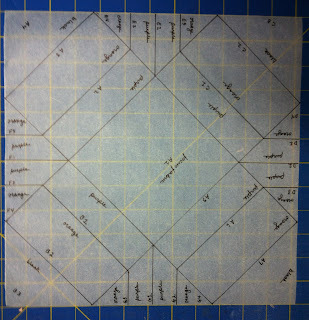 First mark the piecing order and fabric colors for each spot. 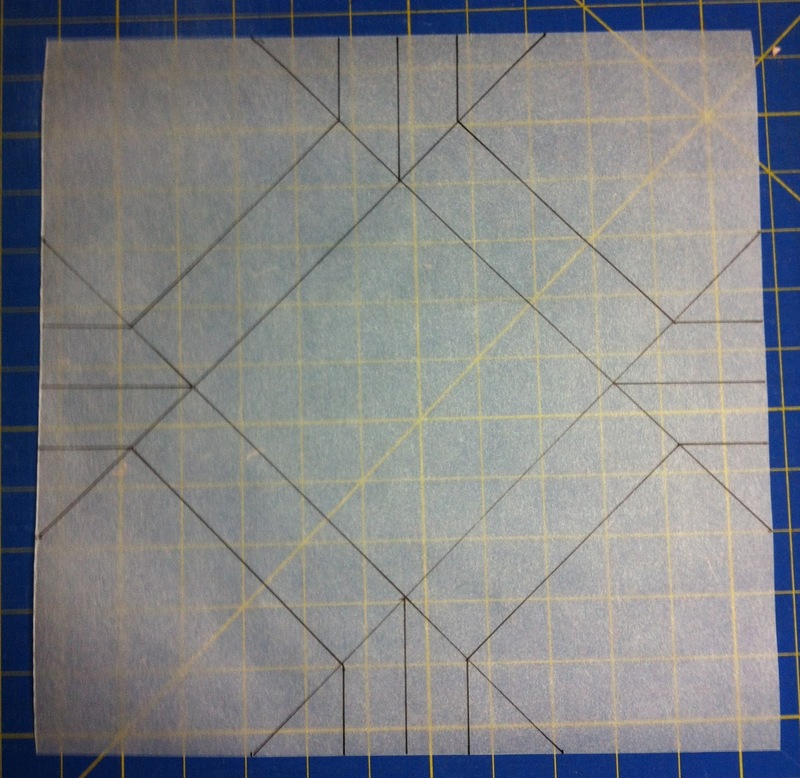 Next you will cut your block into seven different pieces and do your paper piecing. 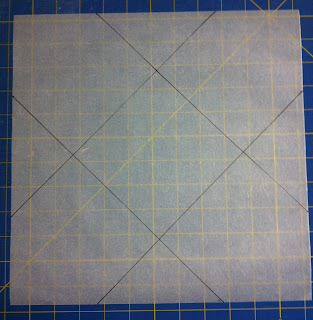 Make sure you extend both the fabric and the stitching at least 1/4" out from the paper foundation, to allow for the seam allowance to join the pieces. 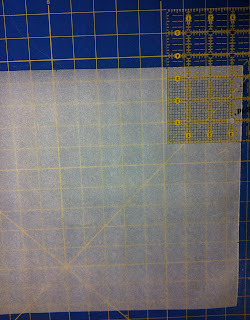 Next trim each section 1/4" past the paper foundation of each section. 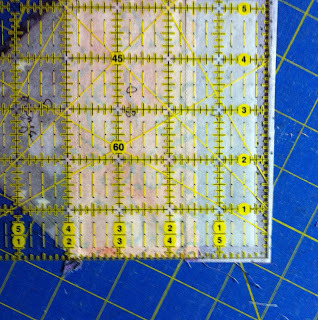 Line the foundation paper up with the 1/4" marks on your ruler and trim. Finally, sew the individual sections together and remove the paper backing, and ENJOY! You'll notice that I actually have two pieces of purple fabric that I sew right next to each other, in the center of the triangles on all four sides. I could have used one piece of fabric there rather than using two pieces. Another option would be to have used two different fabrics for the purple "arcs" -- maybe purple "arcs" on opposite sides and green "arcs" for the remaining two opposite sides. 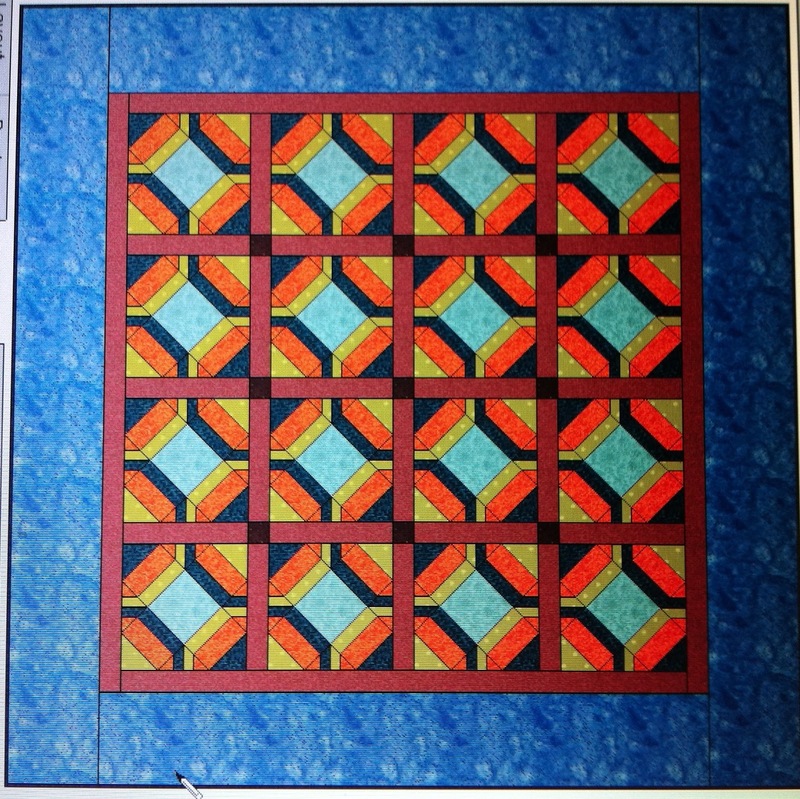 I have put this block into EQ7 and colored it a couple different ways. 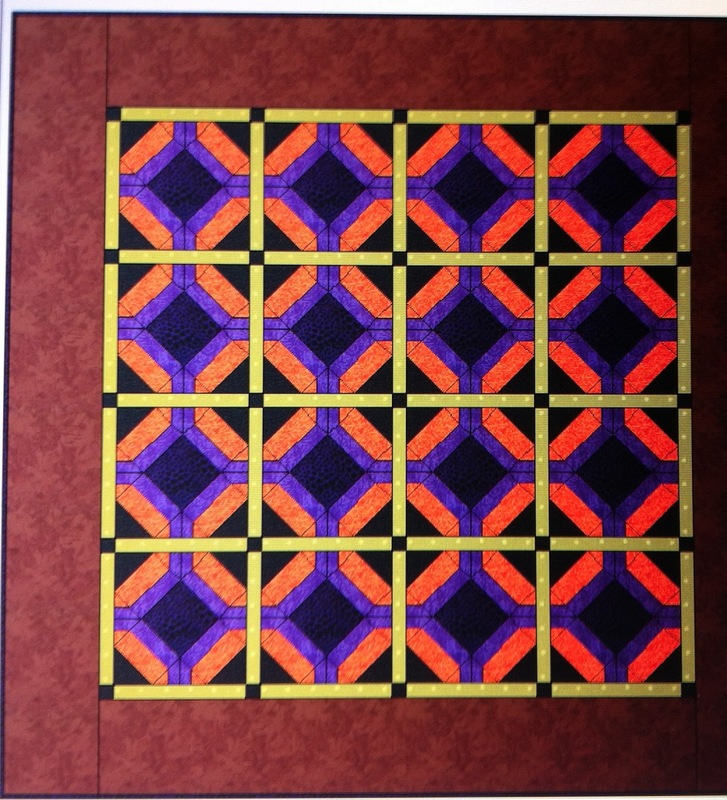 This one uses a small sashing with cornerstones, and all four "arcs" are done in the same color. 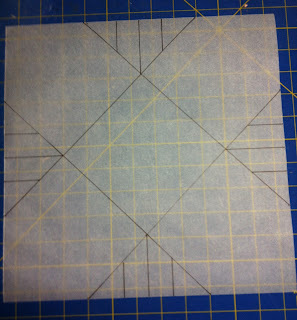 This one has sashing that is a bit thicker and uses different fabrics for the opposite "arcs" in each block. Notice how there is more movement as the two colors twist and turn past each other? I hope you have found this tutorial interesting and that you will try the process to see what you come up with. What do you think happens if you start with a rectangle instead of a square? Happy wanderings to the other stops on today's blog hop! Please visit each of them. I would love it if you became a "follower" and checked back often! Have a wicked day! Tomorrow begins the Wicked Blog Hop. Starting Monday, October 22nd, and continuing for eight days (with no postings on Saturday and Sunday), you will be able to hop around to various blogs and see what wicked delights are offered.....tutorials and giveaways and Halloween inspiration, oh, my! 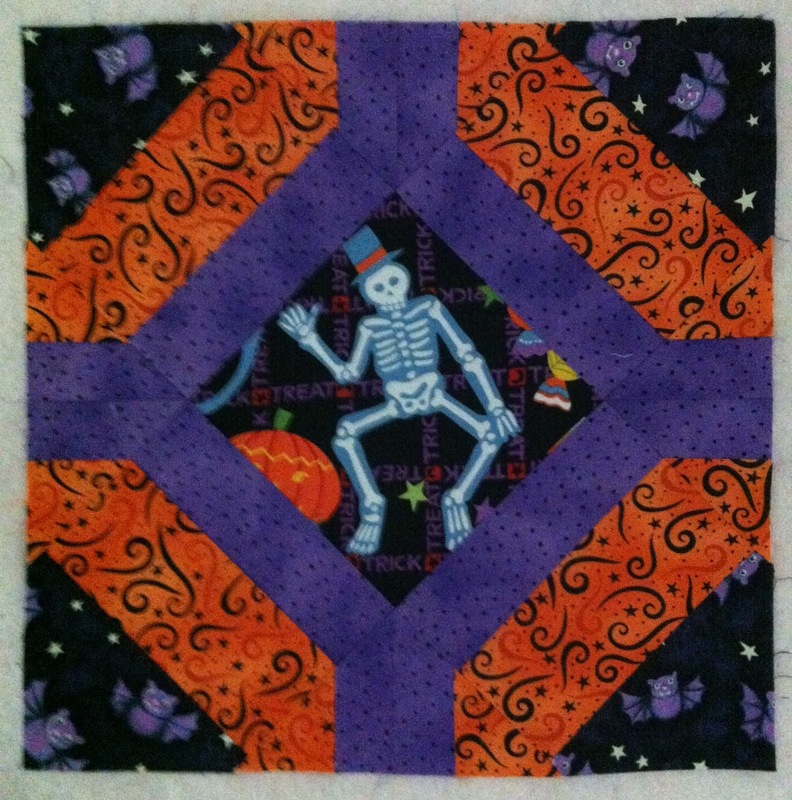 Thanks to Mdm Samm for hosting this blog hop, and especially to Wendy, at Why Knot Kwilt (http://why-knot-kwilt.blogspot.co) for acting as cheerleader for this hop! Click on the button on the right-hand side of my blog for further info and the full schedule. My posting day is Wednesday, October 24th. I hope you like what I have put together!